We visited South Main Baptist Church on Sunday. Thankfully enough, the church arranged the pick-up bus for us, and we could experience the American church service with special attention. Please read the email from Mrs. Eleanor Teal, Special Assistant to Lander President. Thank you, Mrs. Teal! We love you too. FYI – What a joy these Korean students have been. We received the email below from Charles last night. Had a great weekend with the 24 Korean students, plus BoYoung, going to church with us yesterday; and 13 of the students going to our pastor’s home for a social last night. They all seemed to have a good time. I did not initiate this time with them; but Dixon and I were thrilled Jeff Constant and BoYoung arranged it. We got someone to drive our large church bus for the AM Worship Service and our little bus to pick them up for the social. Leo did a great job leading the group and looking after them all. He is a special young man, very polite with wonderful manners. They were all gracious and loving. Our pastor and his family (wife and three children), several adults from our church, and several college & young career age church members enjoyed our time with them, and extended an open invitation to them to come again. Mrs. Linda Dolny, Board of Trustees's member, invited the Incheon students to her lake house. It was a sweet gesture she offered for our students visitors. We'd like to give many thanks to her true hospitality and warm heart. Her house is located at Lake Greenwood. It is a such a beautiful house by the lake and the green garden. We enjoyed the visitation to her house, and it turned out to be a great gathering with good people. President Ambassador students and Asia Summer Study team members came out to the dinner and became good friends of the Incheon students. They enjoyed the tasty barbecue dinner and boat riding provided by Mrs. Dolny's friends, Mr. Mo & Mrs. Nancy Scott. We were so fortunate to enjoy the activities specially arranged for us. In order to return our gratitude to Mrs. Dolny, a couple of Incheon students presented piano and guitar performance. At the end of the visit, Incheon students gave Mrs. Dolny gifts from Korea. She loved those Korean traditional souvenirs. We wish she could visit us in Korea some time soon. We're ready to welcome her in our country. Thank you, Mrs. Dolny. We really enjoyed visiting your sweet home. The last destination of the weekend trip was Biltmore Estates. Biltmore is located in Asheville, North Carolina and it was built in last 1890s. George Vanderbilt was the initial owner of this gigantic house. It is recorded as the biggest private house in the United States. University of Incheon students were amazed by the size of the house and the garden. It was a hot day, but students really enjoyed looking around the inside of the house and taking pictures. The visitation to the Biltmore Estates is meaningful in that they studied Early American history which is the theme of the week. For the second weekend trip, we went to visit Oconaluftee Cherokee Indian Village located in Cherokee, North Carolina. The students studied Early American History taught by Dr. Alice Taylor-Colbert. It was a hands-on experience which students can apply what they learned to the actual life of Cherokee Indian people. We watched how they make traditional baskets, weapons, ornaments, and weaved clothes. Also, we watched the show called "Unto these Hills." The story of the show is about Native Cherokee people's sad history in which they had to leave their own lands forced by the early settlers. Please take a close look at our 24 smiley faces' experience in the Indian Village below and enjoy! The 4th of July is the United States's Independence Day. Ninety Six is the city near Greenwood where Lander University is. It is famous for Ninety Six Historic Site in which Revolutionary War occurred between Loyalists and Patriots. As a celebration of the 4th of July, Independence Day, local people demonstrated the life in late 1700s. People dressed up like 1700s and explained the life of local people at that time. It was very interesting experience for the Korean students to learn more about early American history, which is the theme of the second week. As of Friday field trip for the American Politics and Government week, we went to Columbia, capital city of the State of South Carolina. Dr. Lucas McMillan led the Incheon group and we visited Governor's mansion and the State House. 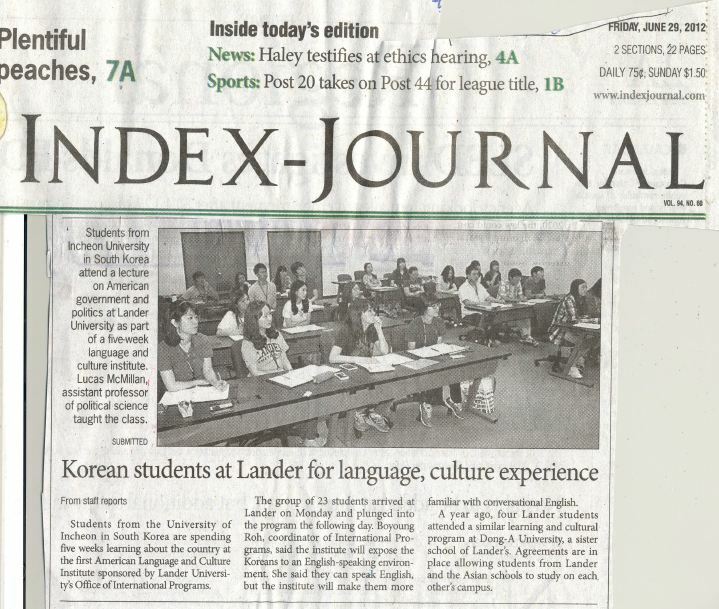 23 University of Incheon students arrived in Lander safely on Monday with Ms. Jeehee Sung, Staff at Office of International Programs at Incheon. Also, six coaches from Korea National Sport University visited Lander for athletic coaching workshop with Mr. Van Taylor, Lander Men's Soccer coach. Lander welcomed the students during the welcoming orientation on Tuesday and especially Dr. Daniel Ball came to the orientation and welcomed them warmly. 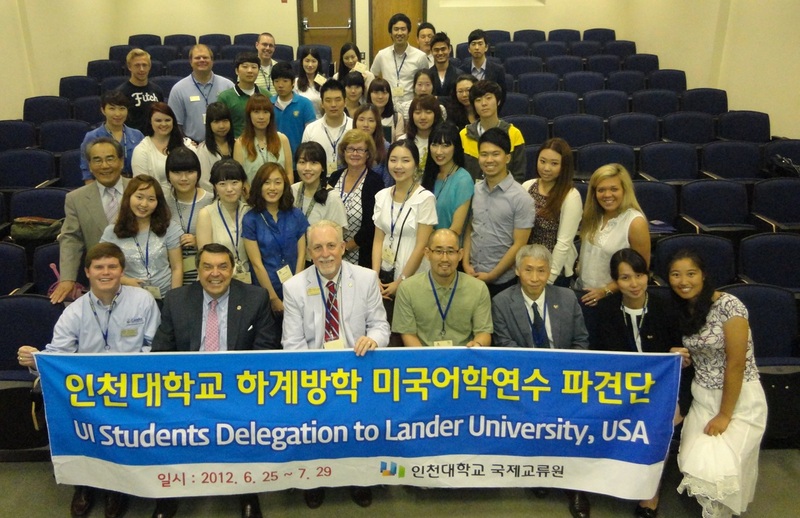 Incheon students will stay at Lander for learning English by taking Intensive English classes for six hours a day along with cultural lecture series for 5 weeks and experiencing American culture by taking trips to historic sites and festivals around South Carolina. Visitations for cultural experience include Cherokee Indian historic site, Biltmore Estates in North Carolina, and Charleston among others.